Cora has cracked the US Top 100, and shows no signs of slowing down. Thanks to Photoquilty for suggesting our Baby Name of the Day. Cor- appeals as a sound. We think of core strengths; the Latin word for heart, cor; as well as vintage names like Nora and Eleanor that share similar sounds. It comes as no surprise, then, that a whole family of Cor- names is gaining in use. In addition to Cora, Coraline, Cordelia, and Kora all gained last year. Beyond the Top 1000, Coralie is rising, too. But it’s the simple, vintage Cora that leads the way. The name was first used in English by James Fenimore Cooper for an ill-fated character in The Last of the Mohicans. The novel was published in 1826, but set seventy-five years earlier. The name fit Colonel Munro’s dark-haired daughter. While it isn’t widely known, Miss Munro is of mixed-race descent. The Mohican warrior, Uncas, falls in love with her. Adventure and romance follow, but neither Cora nor Uncas live happily ever after. Cooper’s book became a success, and his heroine inspired plenty of parents. By the late nineteenth century, it became one of the most popular given names for girls born in the US, remaining in the Top 100 through 1912. The author probably took inspiration from the Greek kore – maiden. Kore served as another name for Persephone. Persephone’s tale of living in two worlds makes sense for Cooper’s tragic character. Persephone married Hades, the god charged with the ruling the underworld. Her heartbroken mother, the goddess Demeter, insisted that Persephone spend half the year in the world of the living, with her. When Persephone returned to mother, she brought spring. When she left to return to her husband, winter came. In ancient days, Corinna was bestowed as a given name. There’s an ancient Greek poet called Corinna, and Ovid called a character in his Amores by the name. Seventeenth century poet Robert Herrick brought the name into wider use in the English-speaking world with his poem Corinna going a-Maying. The French form, Corinne, has enjoyed steady use in the US, but usually ranks #250 or high. At the moment, Corinne sits much higher, in the 700s. Downton Abbey debuted in the UK in 2010, and followed a few months later in the US. The smash hit period drama detailed the lives of the aristocratic Crawley family, as well as those who served in their grand house, for which the show is named. Elizabeth McGovern played the kind-hearted, American-born Countess of Grantham. Born Cora Levinson, her fortune saved the Grantham estates when she married Robert, the Earl of Grantham. Lady Grantham commands respect, but also love. She tends to do the right thing, regardless of class distinctions. She brings an optimism that seems particularly American. Those two characteristics lead her into frequent conflict with her blue-blooded mother-in-law, Violet. Cora peaked in the late nineteenth century, plummeted towards obscurity, but then enjoyed a modest revival beginning in the 1990s. By 2009, the name stood at #303. Then came Downton. The name leapt to #155 by 2012, and reached #88 in 2015. There’s every reason to believe Cora will climb farther. The name fits nicely with other two-syllable, ends-in-a vintage choices like Emma, Nora, and Clara. For now, the name remains rarer than Emma. Though the days of this feeling like an undiscovered gem are over, Cora remains a strong, straightforward choice for a daughter. Would you consider Cora, or do you prefer one of the other Cor- names? This post was published on November 17, 2010, with substantial revisions and re-posts on June 3, 2013 and September 26, 2016. My best friend named her daughter Cora two years ago and it fits her beautifully. We both grew up watching Last of the Mohicans (my favorite film) and she just loved the name. It really is so pretty and meaningful. I have a Corinne born in 2013. And one of the reasons we went with Corinne over Cora was Cora’s rising popularity. What are some girl names that go with Cora having another baby and if its a girl i would like something has great a name as Cora to go with it. I just had a granddaughter named Cora Mae! Our 2-year-old is named Cora Dove. (That the first name.) tons of compliments. I always loved Dove, and figgered if I smooshed it in there with Cora, we could more easily tell her apart from the other Coras. We named our baby Cora in 2012. 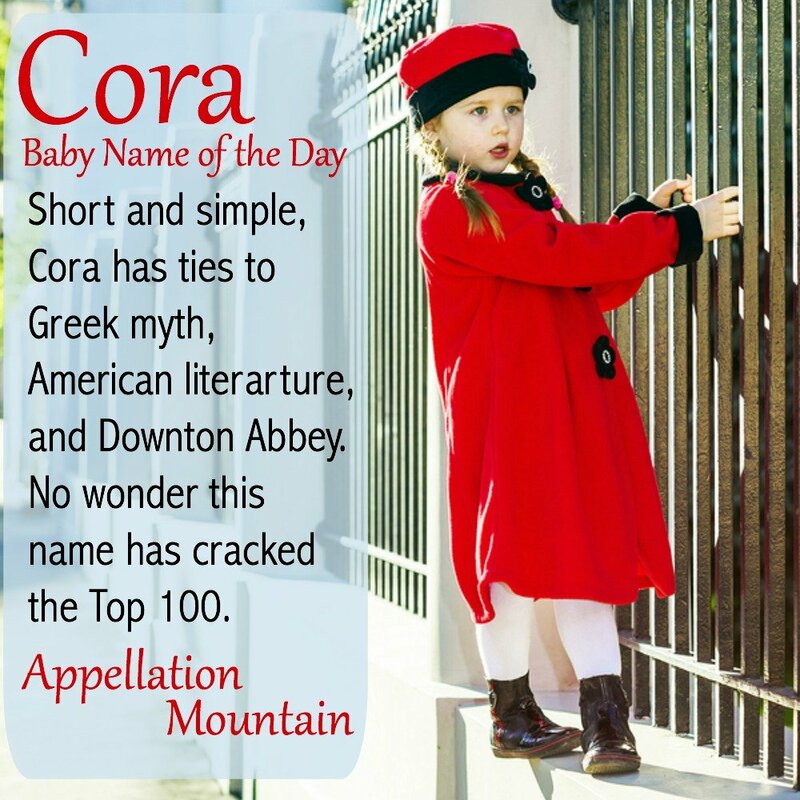 Before she was born I was afraid of Cora’s rising popularity but we loved the name so much we went with it and I am so glad we did! Even though it has gotten relatively popular, I love everything about the name and am a big fan of the story Cora Unashamed. I had some name regret after my son was born but I am so happy we went with Cora! This is what I mean in the off chance that I come across another Cora! It’s very rare and I can’t help but find it exciting. I’ve only met maybe 3. 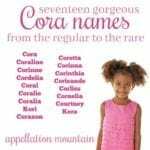 In my family tree, we have lots of Coras and Cornelias. The side of the family that the Coras come from is the Netherlands, around the turn of the century. In fact, it’s mostly all of my great grandma’s sisters who have these names. Her first sister was Cora, but she died at age 14. Then there was Cornelia, nicknamed Cora, followed by a brother, Cornelius, and lastly, another sister, Cora, who was nicknamed Babe. Talk about confusing! It was common, however, at that time, for a family who loses a child to name another child the same thing, but still!!! I guess the other sisters, Adah, Jeanette “Nellie” and Mamie got lucky since they had their own individual names. It’s nice to see the comeback. I know a woman in her late 20’s named Cora, with a sister named Narah. Unique names must run in their family too! There were two Coras in the family. One is my maternal great grandmother, and the other is my paternal great grandmother’s twin sister. It is worth adding that my paternal great grandmother was herself named Nora, which I guess proves that people have always given twins matchy matchy names. Both Coras lived in the rural Deep South and did not exactly have it easy, so I struggle to get past my association between the name and the hardships of rural agrarian society. I hope that Downton Abbey will add some glamour. How funny! My great grandmother was also a twin. Their names were Tessie and Bessie. Yes indeed! My husband’s grandfather was also a twin. (Twins run in both sides of our families!). Their names were Robert and Reuel. I think that is lovely and don’t mind that they both start with the same letter! Interesting coincidence that this has resurfaced as it’s another one on my current list! Intriguing. I really like its simplicity. It’s still rare in the UK (93 babies in 2011) but doesn’t sound dated or an oddity. Downton Abbey doesn’t seem to have had an impact on its popularity, which is good. Torn between it and Clara, actually, which are similar but subtlely different in tone. I named my daughter Cora in 2004. Ever since Madeline Stowe so beautifully portrayed her in last of the Mohicans, I fell in love. People always comment on how her name is pretty but unusual… My two favorite characteristics. I hope it doesn’t become popular! I love Cora! Have you done Melina for a NOTD? I have a friend from HS named for the Greek actress, and just met a 2 year old with the name. Her mom told me she’s one of 3 at her preschool! I went to HS with a Cora (actually, Cora Lee). She was a good friend and nice person. I forgot, I totally love Corinna, too! I like Cora, but like Corinne and Cordelia more. I would use Cora as nickname for either of those in a heartbeat. I really like Cora, it’s short and sweet, but not nickname-y or silly souding. You can see a Cora as a cute little girl, a sassy teen, and a grown woman. It will age well. The French “cor” is also used in music, meaning “horn”… even in English scores you can often find the “cor anglais” (which is kind of funny given that it’s the English horn). Cora appeals to me as a sneaky reference to my musicianship, but husband has already vetoed any C/K names for future kiddies due to overuse in his family. That and we named the dog Keira (after Keira Knightley, of course). Well, I used to adore Cora, thanks to a fabulously creative Kore I knew in H.S. . Sadly, Josie had a Cora in her kindergarten class last year. (Thankfully, not this year!) While Cora was lovely to look at, she had the mouth of a sailor and hence ruined Cora for me. I do utterly adore Coralie, however. Related but not simple Cora. I may still use Coralie in the middle if I ever have a fourth kid (second girl), as in Lettice Coralie Jane. But never Cora. That kid gave Josie fits all last year and gave me nightmares! Oops. I’m Emmy Jo, not Emma Jo. I love Cora, too, because of its sound, its meaning, and its literary ties. For a while, I was wondering if I wanted to replace Clara on our list with Cora, but Clara won out since it’s a family name. I love Cora, but my baby sister is Kara, so I think its too close for comfort for me. I do love Cordelia though! I love Cora too. I think you’re right about people liking the Cor sound. I know it was appealing to us – our list finally came down to Cordelia and Corinne when we named our daughter 6 weeks ago! Corinne won 🙂 I think Cora is a great choice – good nicknames and easy to say, short and sweet. Congratulations on your new baby, Corinne is such a lovely name. Love it. But I have a (girl) cousin named Corey, so Cora is too close to make it onto my list. A woman I know has a daughter name Kora. Not nearly as pretty, IMO. That reminds me, The Legend of Korra is another recent use of the name in media, although I’ve never mentally connected Cora and Korra before. I adore Cora. Good friends of ours just used it or I would be tempted to add it to my list. This might sound strange, but I love the way it feels in my mouth when I say it. This is one of those rare names that I like even more in real life than I do on paper. Gorgeous!